If you live in Arizona, you understand the desert like no one else can. It's not just a dry place, but a beautiful, thriving environment. The desert has its own stark beauty, and you can harness that with your own landscape design in Scottsdale. Due to the unique nature of our local environment, you should take care to practice sustainable landscaping whenever possible. If you need some tips about this, keep reading for advice from Desert Environments. Sustainability in landscaping and gardening refers, in large part, to the environmental impact of your garden. A sustainable garden does not use up excessive amounts of water and other resources. Due to the dry conditions here in Scottsdale, it's crucial for you to be as efficient with your water use as possible. This saves you money on your utility bills, and it also leaves more water for everyone else to use. If water is in such short supply, should you even install a garden? Isn't that just a useless luxury? Not at all! A garden is actually your contribution to the local ecosystem. Housing developments can disrupt the ecological harmony of an area. They dislocate existing plant and animal life. Planting a lawn can help, but most homeowners only grow sodded grass in their lawns, not allowing other growth. The bugs, birds and other species that make up the local ecosystem need more than grass to thrive. That's where the garden comes in. Gardens host a diverse array of different plants. This provides a better habitat for small creatures. Those habitats, in turn, support the local wildlife throughout the region. Birds visit your garden and spread seeds, bees pollinate the flowers, strengthening the genetic stock of flowering plants in the region. This improves the quality of the air and makes the plants more resistant to disease and harsh conditions. When the plants thrive, there's more food for the animals. The animals, by eating the plants, spread the seed to new areas, causing healthy growth. The presence of grass and other plants in your yard also strengthens the soil. Roots spreading through the ground prevent soil erosion. This has the added effect of making your home somewhat less susceptible to damage from flash floods. What can you do to make your landscaping more sustainable? The local ecosystem didn't happen by accident. It's the result of years of growth and development. The native plants and animal species all have their own place here. If you want to truly pay tribute to the beautiful area in which we live consider planting and cultivating local plant species. Native plants have a better symbiotic relationship with the animals that live here. 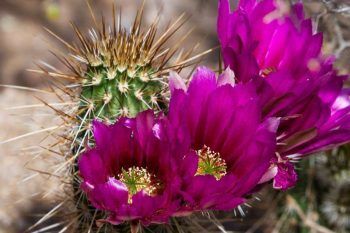 They're also perfectly adapted to the conditions of the Arizona desert and require far less care than more fragile species. Saguaro: Majestic and beautiful, the saguaro is the perfect icon of Arizona. This cactus requires relatively little water to grow. It can last for over 200 years, so you get a permanent addition to your landscaping when you add one. They have flowering blooms, which is good for bees and other pollinators. Ironwood: This expansive tree provides a fair amount of ground cover. It also draws in birds. The birds aid in pollination and can eat pest insect species. They also have the added effect of adding a beautiful splash of color to your space. Sustainable landscaping consists of more than just selecting local plants. You also need to make sure that you're protecting the soil and other areas. For instance, if your home is on a slope, setting up a retaining wall shores the ground up against erosion and landslides. If you run a sprinkler system to water your yard and garden, set up an automatic timer that only runs it at night. Water evaporates quickly in the Scottsdale heat. If you water during the day, you're not really feeding your plants like you thought. You're also spending more money to do less, and are wasting water that could go to other things. If the water droplets end up resting on leaves, they can form a lens, and the sunlight passing through can burn holes into your plants. Water features are pleasant, and the provide a spot for certain species to thrive. If you want to set one up, make sure to put it in as much shade as possible to keep it from evaporating. This has an additional, twofold bonus for fish owners. Shade keeps the water at a more manageable temperature for fish, and it allows them to hide from predatory birds. Do you want to set up your own beautiful oasis but don't know where to start? 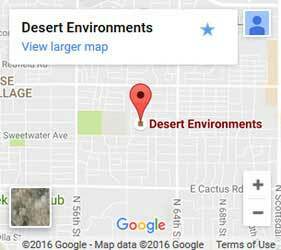 Desert Environments is one of the most lauded teams in the Scottsdale area. Our workers have years of experience in crafting landscape features that hold up to the weather, and which promote sustainability. We keep designers on staff who are up to date on the latest trends. Your new garden is as beautiful as it is practical and sustainable. If you want to get started, just give us a phone call or fill out the contact form on this page. We can sit down with you for a free consultation where you lay out what you want. Whether you've got a vague idea or a complete vision, our designers work with you to make it a reality. We explain all terms to you in plain English and treat your home and property with respect. You can even start small, perhaps with one water feature or just the front yard, and expand from there. Don't go another day without the beautiful, sustainable garden and yard that you dream of. Get Desert Environments on the job today and get the ball rolling today.